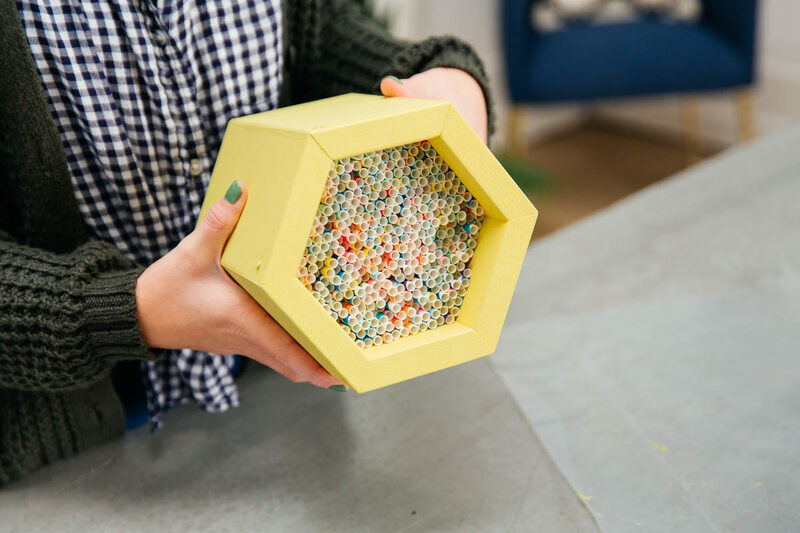 "Beekeeping has always felt so out of reach, but this DIY project is a doable way to take action and make a difference." Today's DIY post is starting out a little different than most: with a science lesson—on bees. By now, we’ve all heard about the decrease of honeybees in the U.S.—populations have dropped a whopping 50 percent in the last 25 years. Due to a growing demand for food, honeybees are being worked harder (and longer) and are consequently falling prey to diseases and disorders that are wiping out entire hives. But, as I'm sure you know, honeybees aren’t the only bees native to North America. You can find more than 4,000 species of bees here, 140 of which fall under the category of “mason bee.” Mason bees have also experienced population loss, but they’re a lot hardier than honeybees due to one thing: they're solitary. Not living in a hive means that they’re not as prone to diseases and pest problems, and because they’re solitary, they can’t be “worked” by commercial agriculture like honeybees can. Even better? They’re easier to keep. While part of me wishes I could keep honeybees (who doesn't love honey? ), the reality is that managing swarms of stinging bees absolutely terrifies me. Mason bees don’t require the maintenance of honeybees, and their stings are extremely tame when they do happen—which is rarely ever. Another major upside is that mason bees are actually much better pollinators than honeybees, with a 95 percent pollination rate. (Honeybees only have a 5 percent pollination rate.) This means fewer mason bees are needed to pollinate, but keep in mind that mason bees have a much shorter pollination radius—they nest within 300 feet of the plants they plan to pollinate, which means that you as beekeeper have a lot more control over where your bees are pollinating. We've even written this post about being a beekeeper in Seattle, and another post about attracting various pollinators to your garden if you'd like to learn more. 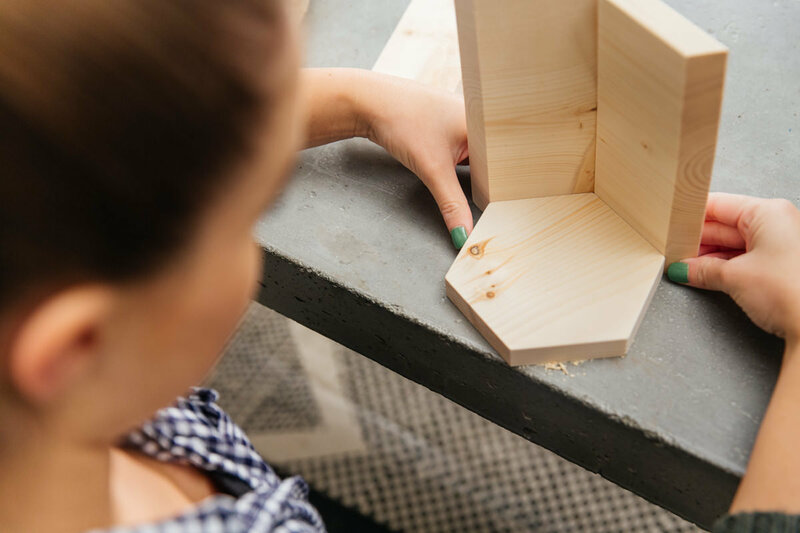 Today we're helping you on your beekeeping journey with a DIY mason bee beehive project. In nature, mason bees lay their eggs in small cavities such as woodpecker holes, insect holes, and hollow stems. But because they don’t make their own tunnels, they seem quite happy to adapt to paper straws (which is what we're using today). The mason bees lay their eggs in a tunnel, partitioned with little mud walls the bees make (that’s where the name “mason” comes from!). The adults die before winter comes, but the pupae live in the little tunnels and wait to emerge until the weather heats up in spring. 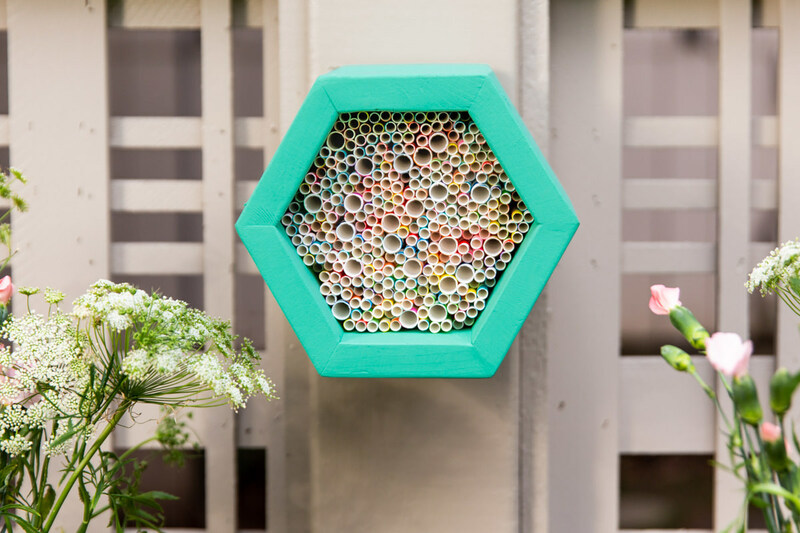 The DIY mason bee beehive we’re building today is a simple structure (similar to the hexagon shelves we made) that holds paper straws for the bees to nest in. Let’s get to it! 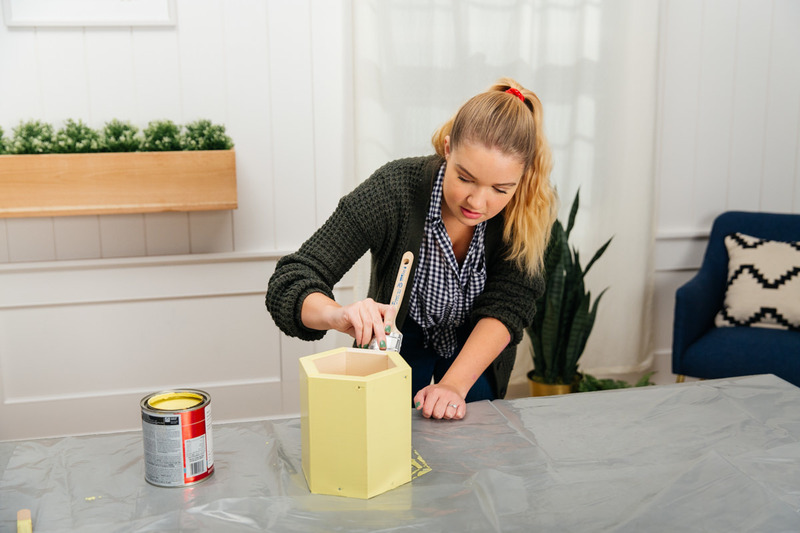 For this project I used spruce—it’s an inexpensive wood choice, which is great because I plan to paint this hive. For a natural wood beehive you could use cedar as a long-lasting, weather-friendly alternative. To start, we'll cut the sides of the beehive. Clamp down your wood, then set your circular saw or miter saw to a 30° bevel angle. Cut the end of the one-by-eight at this angle, and then flip the board around to cut the same angle in the opposite direction. The end of your cut piece should look like an isosceles trapezoid with the longest side measuring 3 1/2". For one hive, repeat until there are six pieces like this—these will be the walls of your hex-shaped hive. 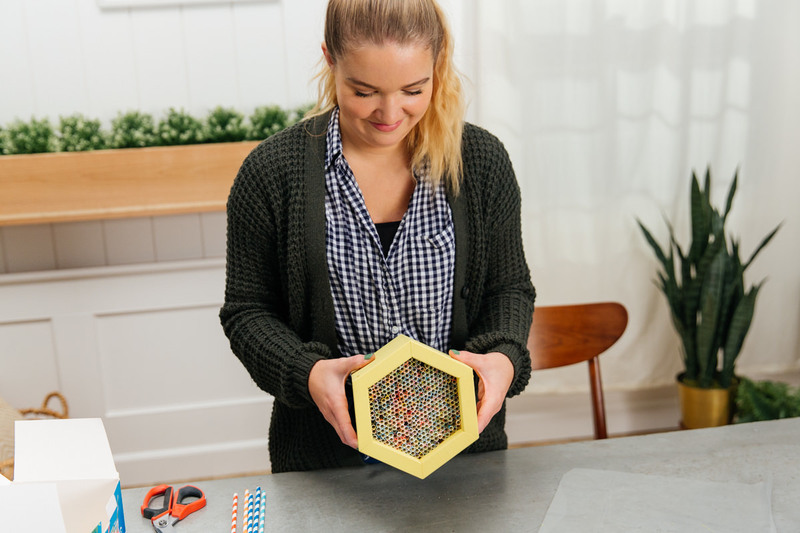 Download our handy template below, then cut the remaining part of one-by-eight into the hexagon shape to fit into the back of the hive. 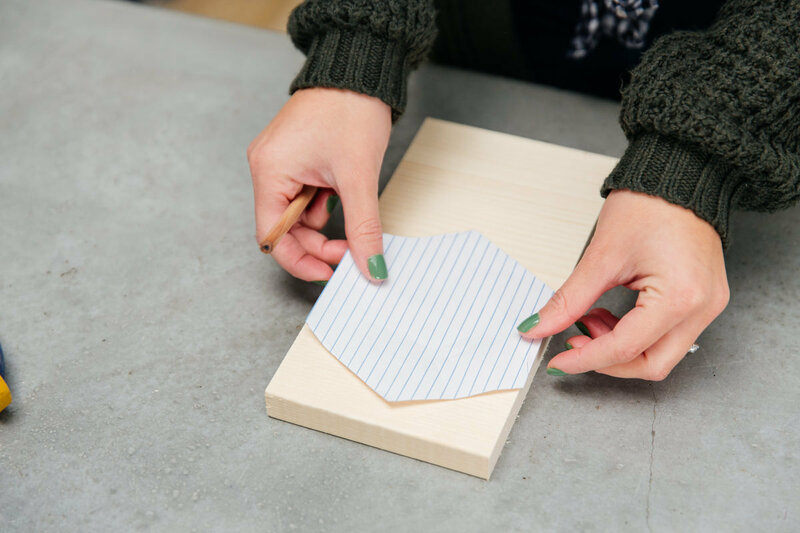 To do this, trace the template's hexagon on your board, clamp it down, then cut it out. 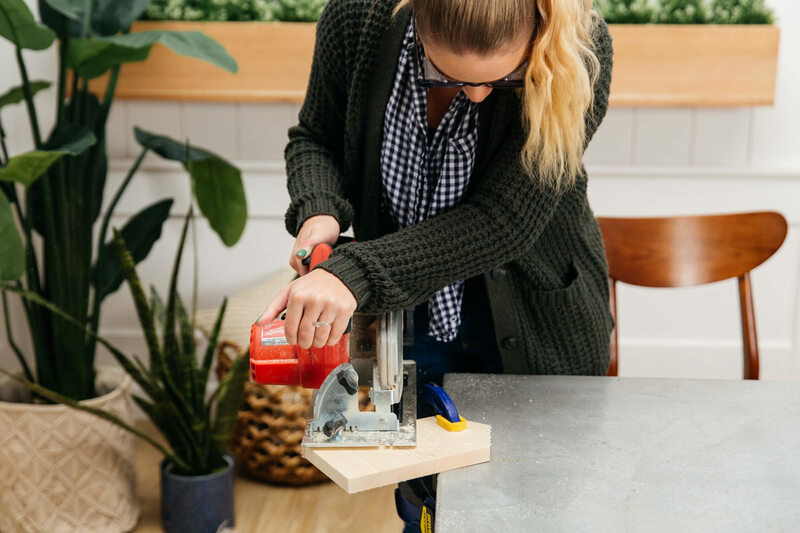 If you’re cutting with a miter saw, set the miter angle to 30°. 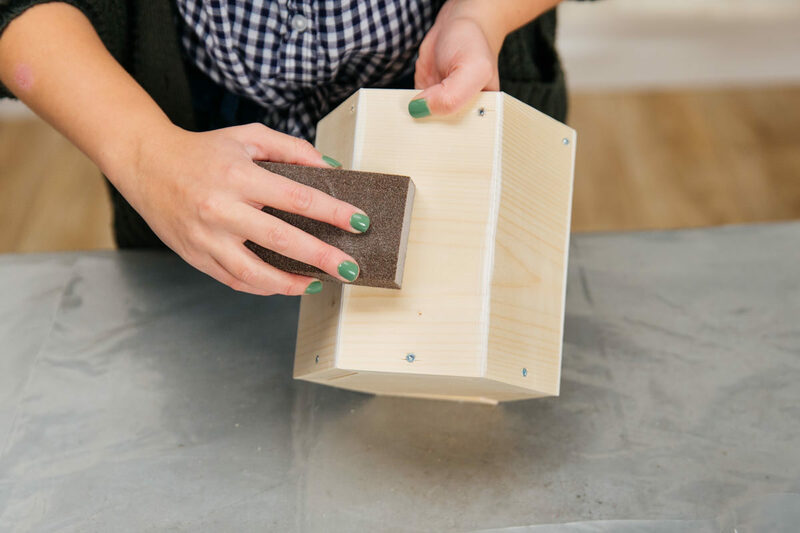 Sand all pieces with a sanding sponge or sandpaper. Because this will live outdoors, the sanding doesn't need to be excessive. Line up the walls with the hexagon back. At about the middle point of each side, pre-drill through the walls into the side of the hexagon and secure with screws. 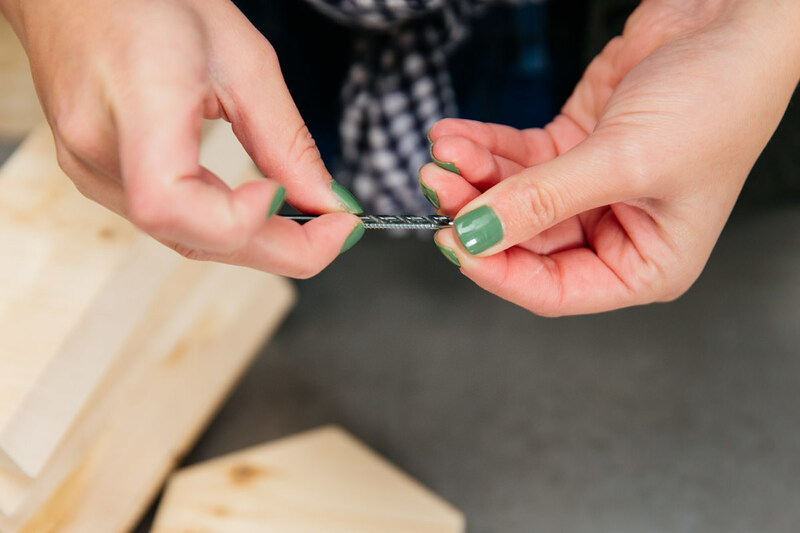 If your seams are nice and snug, you can add glue before your screws to waterproof your hive. I had some gaps between the walls, so I skipped the glue at this stage and added some caulk later. Once all the walls are attached to the back, you can secure the walls to each other with screws. 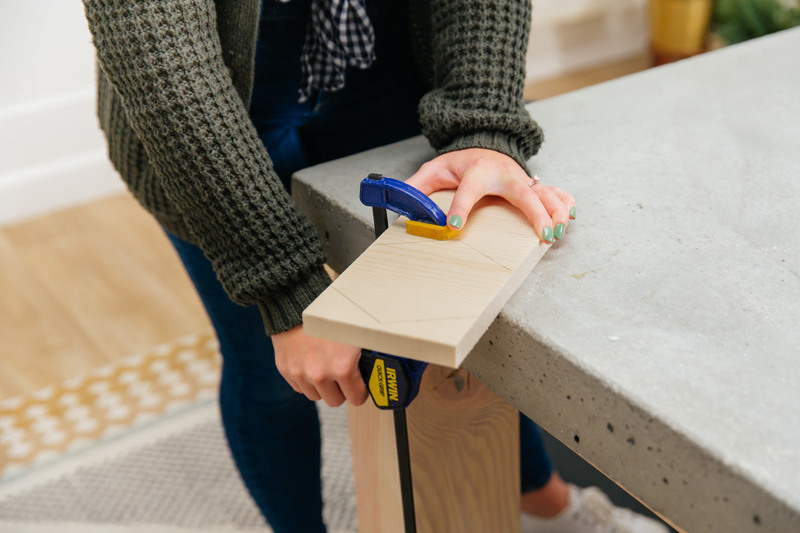 For this step, I highly recommend the use of a countersink drill bit. I found that even with the trim-head screws I was using and pre-drilling, the wood was splitting when I drove in the head of the screw. 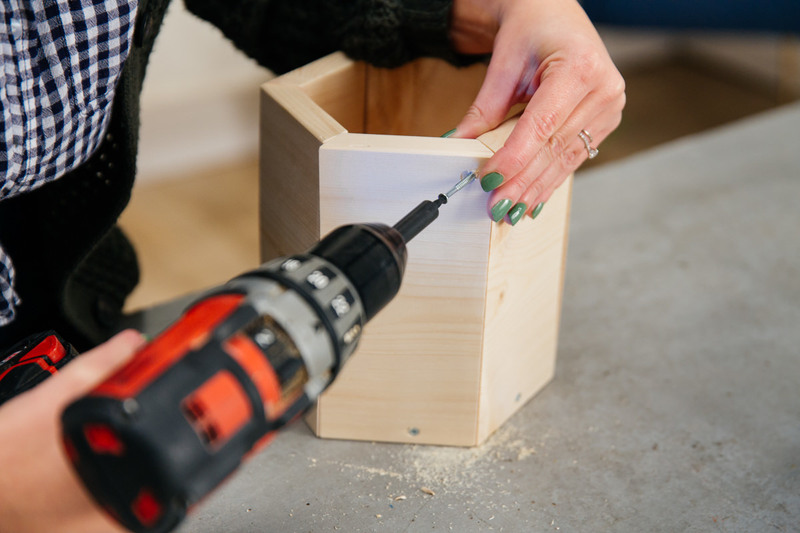 A countersink bit pre-drills a hole for the shaft of the screw and then pre-drills a large hole at the top for the head and prevents this splitting. 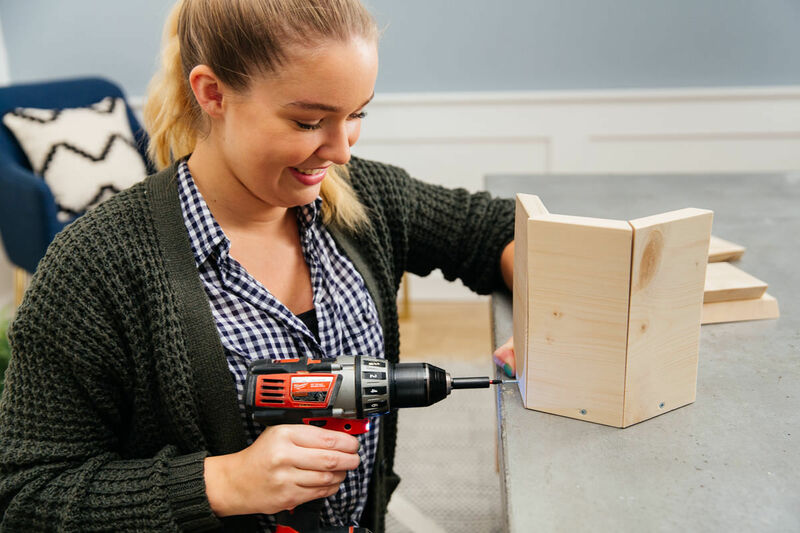 When pre-drilling at an angle like this, start with the drill bit perpendicular to the surface until it catches, then turn it to the desired angle. 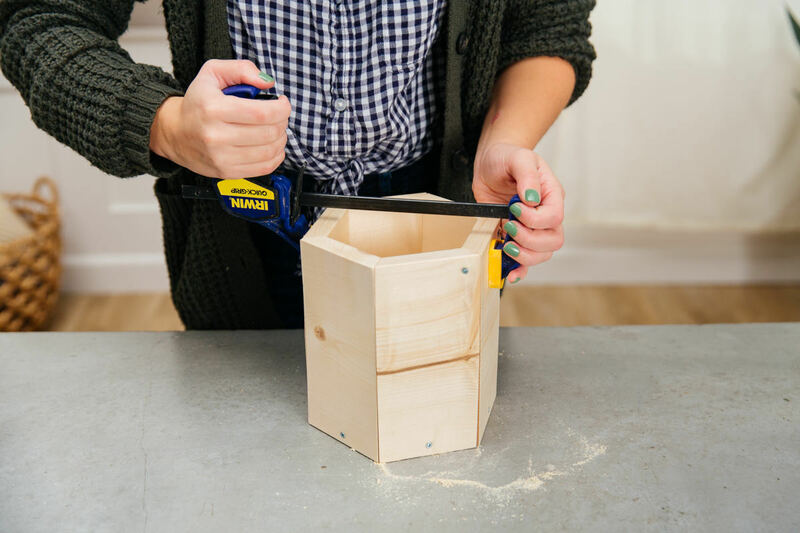 If necessary, use a clamp to line up pieces for easy drilling. This was the step where I realized the cracks I had were too big and my bees would get wet, so I added some caulk to waterproof the seams. Make sure you’re using a paintable caulk if you’re planning to paint and a wood filler if you’re not. Sand down after it’s dry. If you’re planning on hanging your beehive on the outside of a building where it’s covered by the eaves, you don’t need to worry about this step. 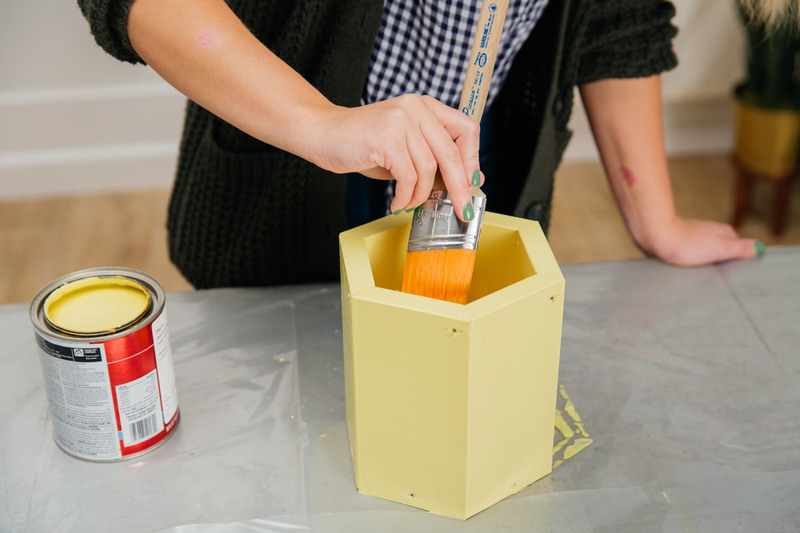 Paint the hive with exterior paint and allow to dry. 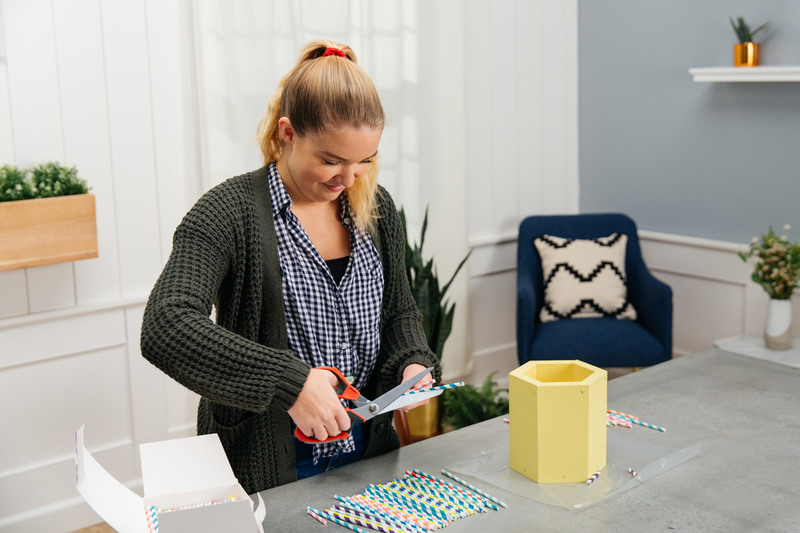 This is where you can get creative—you can pick a color that matches the trim of your house or your front door so that everything blends together nicely, or you can go bold and bright. Have fun! 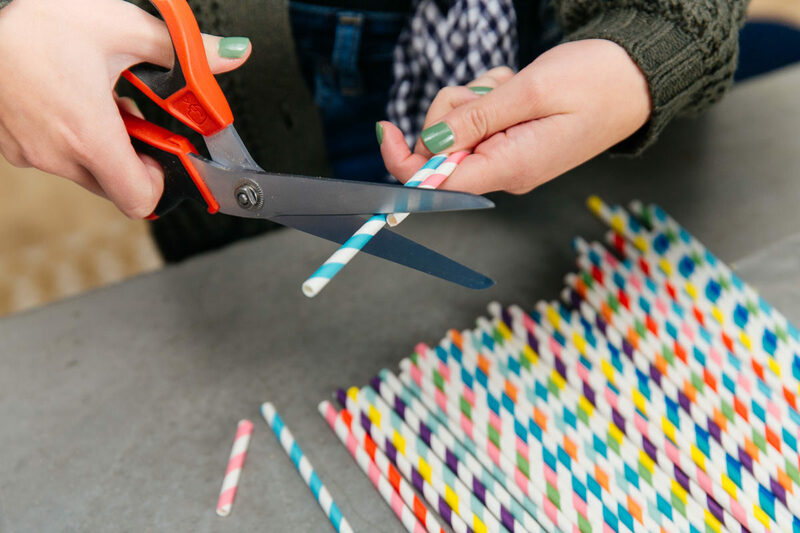 Why paper straws? I spent a lot of time researching various approaches to keeping mason bees and a number of them looked a little more involved than I was interested in. By far my best resource (and the one I trusted the most) is the Honey Bee Suite. She’s been keeping mason bees (along with other types of bees) in Western Washington for seven years and actually has a mastery in beekeeping. I love finding people who are knowledgeable and local so I can trust that what they’re saying is relevant to me. 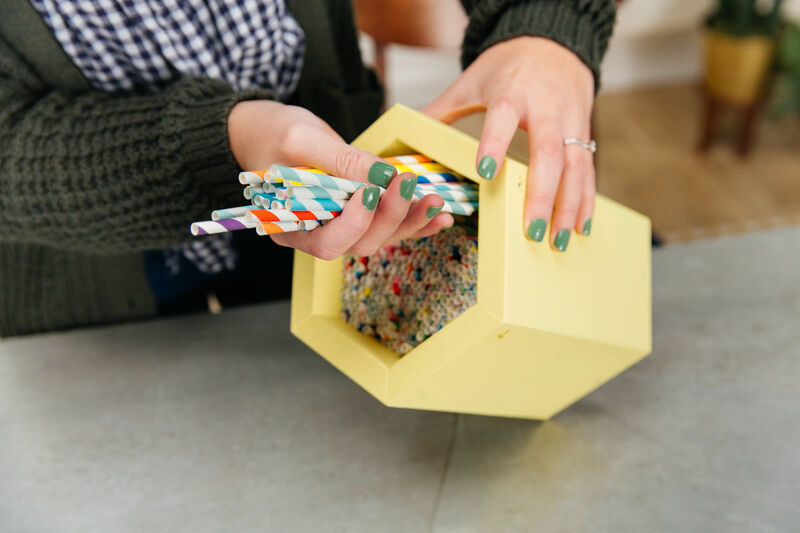 Honey Bee Suite recommends paper straws because they can be moved easily, they’re breathable (which means less pests and less disease), and they’re disposable—giving the bees a clean environment each year (this also prevent diseases). She says that the regular 1/4” straw size is fine for the bees (and that her bees prefer it), but also recommends you provide a variety of sizes. For more info about tunnel sizes, check out this article. I want my beehive to be a stand-alone construction that I can hang on a fence or a tree, so that means that the straws need to be at least an inch inside the hive to provide some protection from the elements. If you're hanging yours in a sheltered spot, you can cut the straws to the same length as your house. Measure and cut your straws to length, then fit them tightly into the hive so the wind won’t dislodge them. Now that your hive is built, you need to hang it. 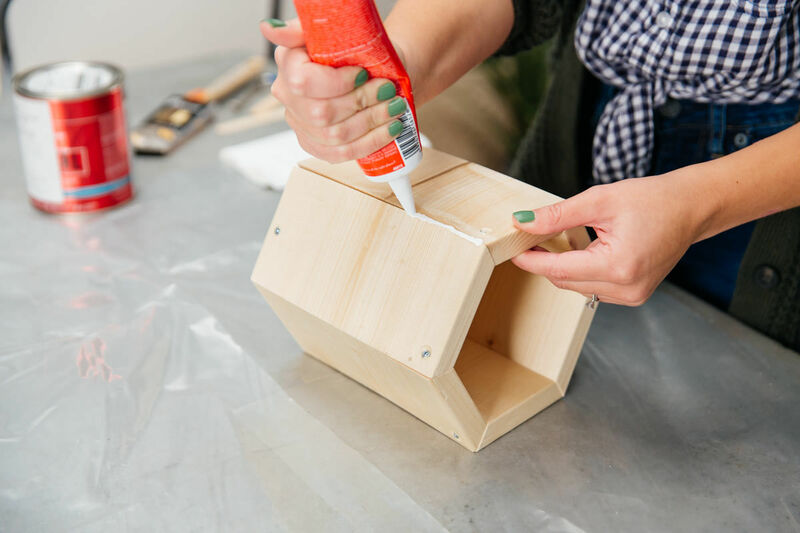 You can use ring hangers or drill a hole in the back to seat the beehive on a nail. A few things to keep in mind: your hive should be six to seven feet off the ground and face south or southeast so the bees can warm themselves in the morning sun and make the most of the day! And don’t forget to keep the hive within 300 feet of the plants. You can set out a mason bee beehive and hope for the best, or you can order some mason bee cocoons from Crown Bees in Woodinville. Leave them next to your hive, and when the weather is warm they’ll come out of their cocoon and move right in! You can even sell your cocoons back to Crown Bees to help populate other local gardens and farms with bees. There are tons of resources out there, so do some research. 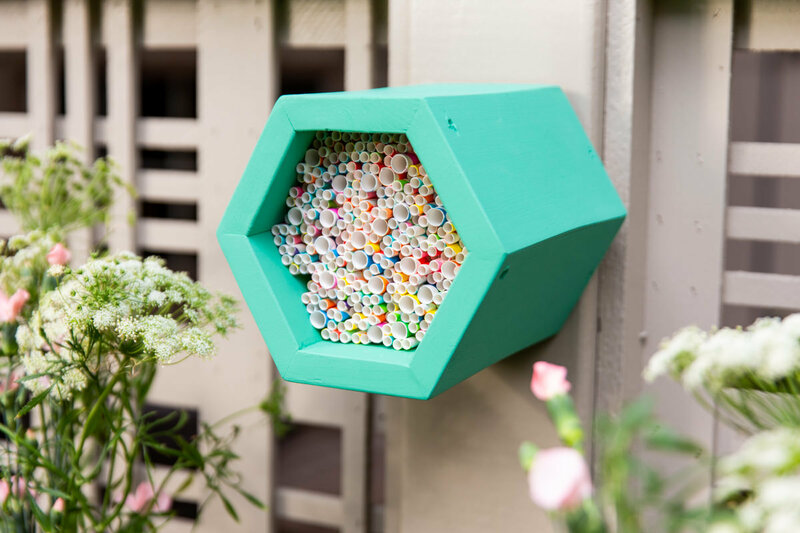 I love how cheery this DIY mason bee beehive turned out, and how the hexagon shape of the hive and honeycomb pattern of the straws has me thinking about bees (even if I am thinking of honeybees). Beekeeping has always felt so out of my reach, but this project is a doable way to take action and make a difference. Just remember that you need plants for the bees to pollinate, so check out our post about how to make a pollinator friendly garden! For more info about mason bees, take a look at this article from Gardener’s Supply Company. 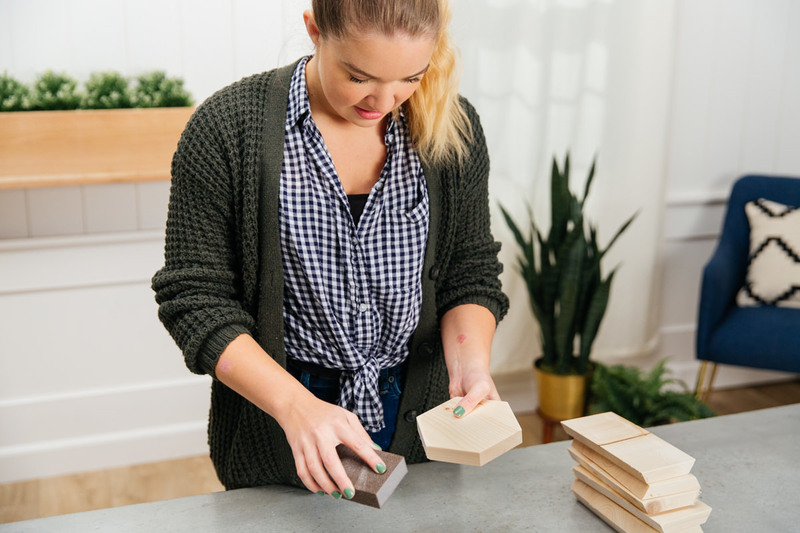 If you love the look of raw wood, cedar is a wonderful option because it's naturally rot-resistant and has a beautiful, classic look to it. But regardless of what lumber you go with, this project will be stunning.